Being a parent is challenging in its own right, and parenting a child with autism spectrum disorder (ASD) brings its own unique challenges. All parents want what’s best for their children, and it takes time, effort, and money to develop the whole child. However, navigating systems of support for children in the US can be complex, to say the least. From deciding which daycare is best for your child and then finding a school that suits his/her needs, to securing a job with a salary that pays enough to support a family and also provides adequate healthcare, it is a real struggle for many parents in the US to make ends meet. Add a $50,000 bill to pay for Applied Behavior Analysis (ABA) therapy for your child with autism, and that struggle can become an insurmountable obstacle without outside support. More research has also led to the adoption of state laws that require insurers to cover evidence-based treatments. Early diagnosis, early intervention, and ABA therapy are all considered effective in supporting independence and positive outcomes for children with ASD. Although almost every state now has a law requiring insurance coverage for autism treatments, many states have limits on ages and dollar amounts to cover ABA therapy, and available treatment services vary widely from state to state. This means the level of support your child receives will vary as well, depending on where you live. 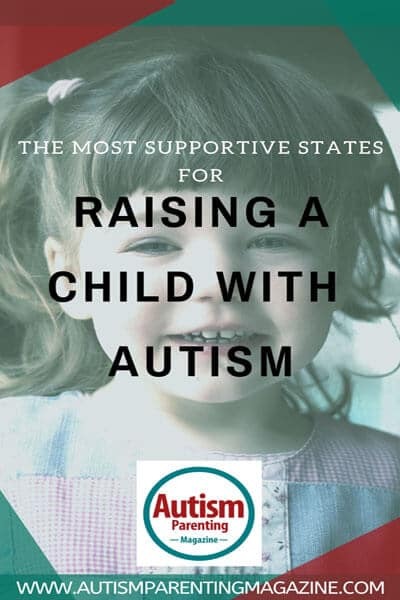 In order to help parents discern the most supportive states to raise a child with autism, below is a list of states ranked based on several factors that impact the lives of children with autism and their families; with 1 being the most supportive and 51 the least supportive. * Multiple grants available for this state. California, Massachusetts, Indiana, and Colorado are the most supportive states for children with autism. None of them have limits on age or dollar amount for insurance coverage (with the exception of what is allowed under the Affordable Care Act). Colorado is the only state in the top 5 that is part of the ADDM network. It is also the only state in the top 5 without grants available for residents, according to resources listed by the Autism Support Network. Idaho is the only state without a state law requiring at least some coverage for ABA therapy. New Mexico and Florida are the only states with a state law requirement that specifies a lifetime coverage limit. Out of the 33 states that specify a maximum coverage amount, Wisconsin, Arkansas, South Carolina, and Kentucky are the only states with a maximum yearly coverage amount up to $50,000, which covers the average cost of ABA Therapy for one year. Nevada has the highest maximum coverage amount at $75,000 per year. The more you learn about ASD, the better you can advocate for your child and their specific needs. Do your research, explore potential treatment options, and ask lots of questions so you can make informed decisions and help your child thrive. Technologies like wearable GPS trackers, which have features like two-way talk and real-time location tracking, can give you peace of mind and help keep your child safe. Free and low-cost apps like Find Me and Quick Talk AAC help children with ASD practice social skills and communicate their needs. Noise reduction headphones can be helpful for children with auditory sensitivity. The National Autism Association offers resources and tools to help keep your child safe and connects parents and caregivers through local chapters and support groups. The Autistic Self Advocacy Network is a nonprofit organization run by individuals with autism that advocates “equal access, rights, and opportunities” for people with autism. Although some states have broader support for individuals with autism, you can still find communities of support and resources to help you and your child with autism thrive wherever you live. Krystal Rogers-Nelson is a freelance writer and parent of two young children living in Salt Lake City, Utah. She has expertise as a youth development specialist, with 14 years of experience teaching and administering experiential out-of-school time programs for children (ages 3-18) from social, economic and ethnically diverse backgrounds.